So you just bought Tom Clancy’s The Division, now what? 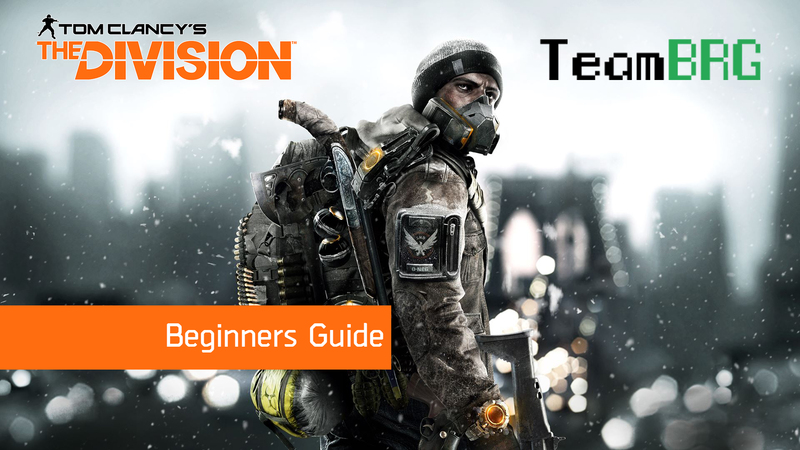 Here is our detailed guide for all you beginner agents out there who have no idea what to do. The Division is a cover 3rd person shooter, so taking cover is going to be your main reaction towards enemies. The levels are designed in such a way that there should be adequate cover for all play-types. If you love to rush in with a shotgun or hang back with a marksman’s rifle, there always will be cover between you and your enemies. Take note however, enemies will also actively look for cover or even just rush your position if you stay behind the same cover for too long. Shooting from behind cover is more stable than shooting while standing. Additionally, you can blind-fire from cover which reduces your chances of getting hit but greatly reduces your accuracy. Aiming down the sights is what you will be doing most of the time but you can look down a scope increasing the zoom even further. This only works with some scopes, mostly found on marksman rifles. Firearms increases the damage your weapons do. Stamina increases your overall health pool. Electronics increases the strength of your skills. Sidearm – Has infinite ammo and are mostly pistols. Can also be a sawed off double barreled shotgun. Light-Machine Gun (LMG) – Mid to long range automatic gun with high ammo capacity and suppresses enemies extremely well. Assault Rifle – Mid to long range automatic gun that is a good middle ground between the SMG and Marksman Rifle. Shotguns – Unmatched in close range combat. Range is extremely short but has a high damage output if all 8 bullets hit in each shot. Each weapon type has its own exclusive ammo type so it actually isn’t a bad idea to carry a 3rd weapon type around just in case you run out of ammo. Weapons and armor have specific mods that you can attach to them. These mods increase their overall effectiveness, some mods increase accuracy, firing range, etc. Performance – Increases a minor attribute like disrupt resistance or enemy armor damage. Also increases a skill attribute like sticky bomb damage or turret duration. You will notice quite quickly that items you pick up are color coded, each color refers to the rarity of the item. As you increase in level, you will start looting higher quality items. These apply to weapons, gear, and mods (for weapon and gear). Main missions – are the main missions that progress the story forward. These missions have clearly marked character level recommendations and rewards. You can also tackle these missions in hard or challenging modes. Side missions – each zone has its set of side missions. Highly recommended to tackle these first for a good exp boost. Encounters – each encounter is color coded (green/blue/yellow) which corresponds to what base supply resource you will receive when you complete these encounters. Supply resources are used to upgrade your Base of Operations. When you first arrive at Camp Hudson at around level 4, don’t forget to interact with these two. They are the ones that will mark all side missions and encounters for that zone. Each zone will have these two things located inside the safehouse of that area. The very first main mission you come across after landing at Camp Hudson, will be to take back the Library and set up a Base of Operations. This is the most important building for you since you will be upgrading it, expanding its functions over the course of the entire game. Each base upgrade can unlock new skills, talents, perks or even new vendors. Skills – Are all your active skills like the Sticky bomb, or the Support station for healing. These eventually will have mods which are essentially upgrades for your skills. For example, the Sticky bomb with the flashbang upgrade will have less damage overall but will blind/deafen enemies in a larger area. Perks – are permanent passives that your character will always have. Though not as powerful as talents, they are still extremely useful. These perks increase total medkits, or grenade capacity or improve your inventory size. The optional PvP zone that has a separate experience and currency. You will not gain normal character experience while in this zone. This zone is the best way to farm loot but beware of rogue agents trying to steal your loot! You lose 3 items, some experience and currency with each death. You can start entering the Dark Zone at anytime, there is no level requirement. In the Dark Zone, your goal is simple, run around trying to obtain better quality loot. Now, all loot you obtain from the Dark Zone is tagged as ‘contaminated’ and in order for you to use them, you need to send them up for extraction. The Dark Zone has various extraction points and you have to call for an extraction and defend that point until you can extract your goods. Be careful though! Even other Division agents may turn rogue and try to steal your hard earned loot! Find a friend! The Division is much easier and a lot more enjoyable with a group. Thankfully the matchmaking system is excellent and easy. Each safe house has a matchmaking laptop, but you can also enter the matchmaking system when entering a main mission or in the map. Main Missions also spawn more enemies depending on your party size. Maximum party size at the moment is up to 4 players. That’s it for our beginners guide. Do you think we missed something out? Please let us know!